Richard Woods was born in 1898 on Caythorpe Heath (near Caythorpe Court) where his father Joseph worked as a farm yardman. By 1911 the family had moved near to the post office in Normanton. 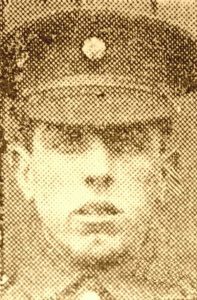 Richard was 18, living in Normanton and working as a farm servant when he enlisted in the Army at Lincoln in May 1916. He was called up in Jan 1917 and joined 4th Battalion, Prince of Wales’ North Staffordshire Regiment. Before being sent to France on 6th Oct 1917 (sailing from Southampton to Le Havre) he made out a will leaving his effects to his mother, Fanny. He was killed in action a year later on 1st October 1918 (age 20), whilst serving as a private with A Company during the 5th Battle of Ypres. He is buried at the Menin Road South Military Cemetery. His name is on the Normanton War Memorial. In Mar 1919 his metal cigarette case and electric torch were sent to his mother in Normanton. A year later she received a memorial scroll. In 1920 the family moved to Casthorpe, near Barrowby. The British War and Victory Medals were forwarded to his mother in 1924.